Note Block is used to decorate or play music. Clicking on the note block will play a single note sound. If you right click the block it will change the pitch created. This can be done 24 times in which it will then start from the first pitch again. 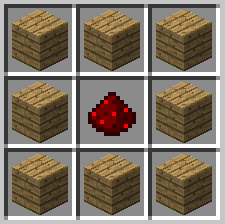 Note blocks are able to be activated from Redstone power to play allowing creative rhythms to be automated. Depending on what block this item is standing on, it will actually change the instrument of the music. A bass guitar is created when the item is placed on a wooden block, wooden stair, note block or jukebox. Snare Drums are created with gravel, sand, or soul sand. Bass Drum is made from any blocks of stone(stairs, slabs, etc. ), Obsidian, Netherrack or Netherbricks. Sticks instrument is made by placing the note block on Glass, Glass Panes or Glowstone. Pianos is played when the Noteblock is placed on any other item that has not been listed for the other types.